How to make rice meals healthier and low on Glycemic Index? This is a frequent question I keep getting from the readers of this blog. This recipe of sesame fenugreek rice is a demonstration of how one can easily enjoy a rice meal and still keep the Glycemic index low, and even the macro and micro nutrients balanced in this one pot meal. 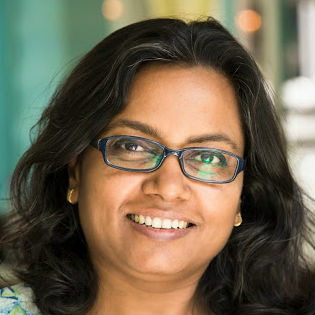 Rice has become such a soft spot with nutrition seekers and dieters in our country. More than anywhere else. No other place celebrates rice as much as we Indians do, especially in the coastal regions. I know I know, the Chinese and the Japanese, Koreans and all the coastal countries probably consume rice as a staple grain, but I feel the proportion of rice on an average Indian's plate is much more than needed. Daal bhaat (lentil n rice) is a common name for a meal in some parts of India, daal roti and just 'roti' is a common slang for a meal. A Punjabi would say chalo rotti kha layiye (for let's have our meal) and a bong would say bhaat kheye naao for have your meal. In the central parts of India too it is like daal roti or daal bhaat. We certainly heap our plates with rice (or other grains, mostly refined now a days) and that is not healthy especially in modern context where we sit on chairs all day long. The grain heavy diet is fit for a farmer but not a desk bound worker. We Indians take very small servings of lentils and vegetables on the side in a vegetarian meal as a habit, even though there are several vegetable and lentil side dishes. With a meat or fish meal the proportion is healthier though, but still not perfect. If the rice is white and refined, stripped off its goodness, the nutrient proportion is even more tilted. You know what I mean. If the proportion of rice for a meal is lower than other healthier ingredients, a white rice meal could be healthier easily. Like it is in the other east Asian countries, as their plates are loaded with greens and vegetables and some meat or fish so the rice makes a small portion of the plate. So the moral of the story is, load you plate with more vegetables and protein and enjoy your white rice once in a while or even everyday. A practical solution for all of us who have grown up eating the tastier (polished) rice and now crave for it even when we know it is stripped off it's goodness. Add more goodness to it. See how. dry red chilies broken 2 nos. Make a coarse powder of sesame, coriander seeds, cumin seeds and black peppercorns together. Keep aside. This mixture can be made in large quantity and kept in a airtight container, preferably in fridge for a month or so. Heat oil in a pan and throw in the asafoetida powder first.Now add the broken red chilies and let them get roasted, keep the flame low and take care not to burn them or else be ready for a bout of sneezing. Then add the powdered mix into the oil and stir fry for a few seconds till it gets aromatic, taking care not to burn the mixture. Now add the chopped fenugreek leaves and stir fry, increasing the gas flame so the fenugreek leaves become soft and wilted. Not much cooking is required and the leaves need to be semi cooked when finished. Add in the cooked rice, mix well and adjust seasoning. Add lemon juice or amchoor powder if required. Adding a bit of tamarind juice could be favorable for you too. 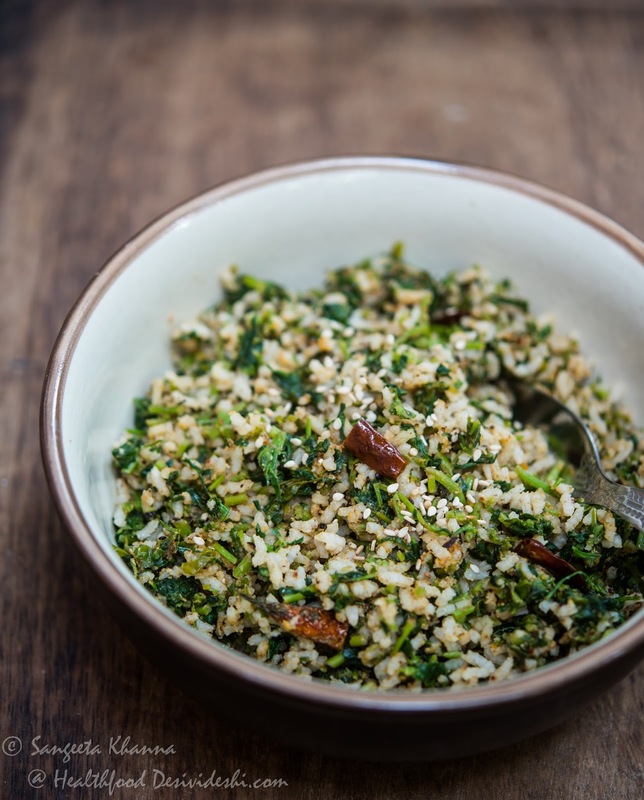 Another variation will be to use any greens instead of fenugreek and add some crushed peanuts instead of sesame spice mix. You will have to adjust seasoning accordingly. In the above picture I used Agasti (Sesbania) leaves along with a lot of chopped onions. The amount of chopped onions and chopped leaves is one cup while the cooked rice is 1/2 cup for one serving, 1 tbsp crushed peanuts are good enough. The white rice is fortified well with proteins and leafy greens in these one pot meal recipes, all cooked together for a convenient quick meal. Having a salad or vegetable based raita would be great with it. Or just a tall glass of buttermilk if you want it really quick. It is a very flavorful way to eat white rice. You can have a bowl of daal on the side too and make the fried rice a bit bland in that case. On it's own it is a hot dish if made with the suggested proportion of spices, so adjust the heat level to your liking and mood. I need my spices according to seasons and my moods. For summers I would have a bowl of plain yogurt or a glass of plain buttermilk with it for sure. 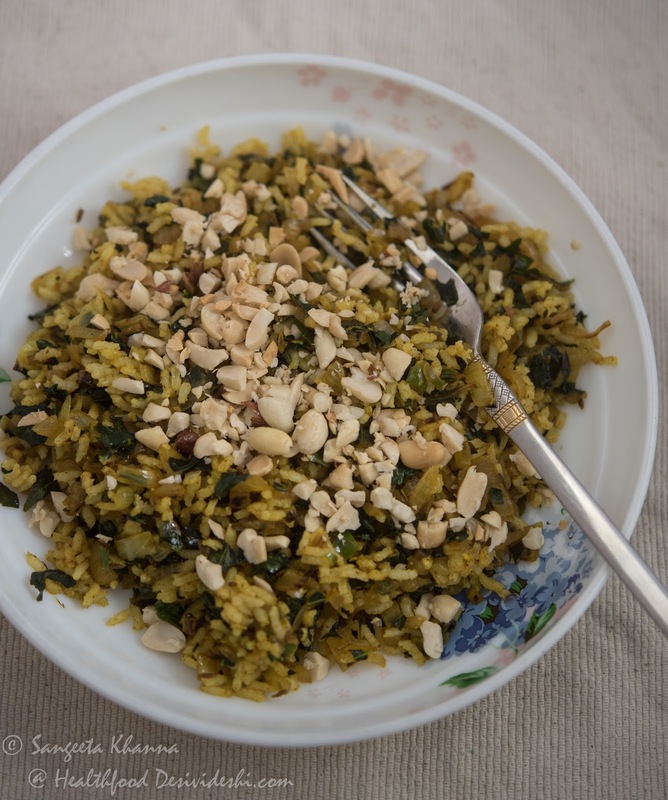 Another way to make such a fried rice is using some curry leaves, chopped onions and roasted peanuts with it. This recipe works well for those who are not very fond of raw salads on the side. 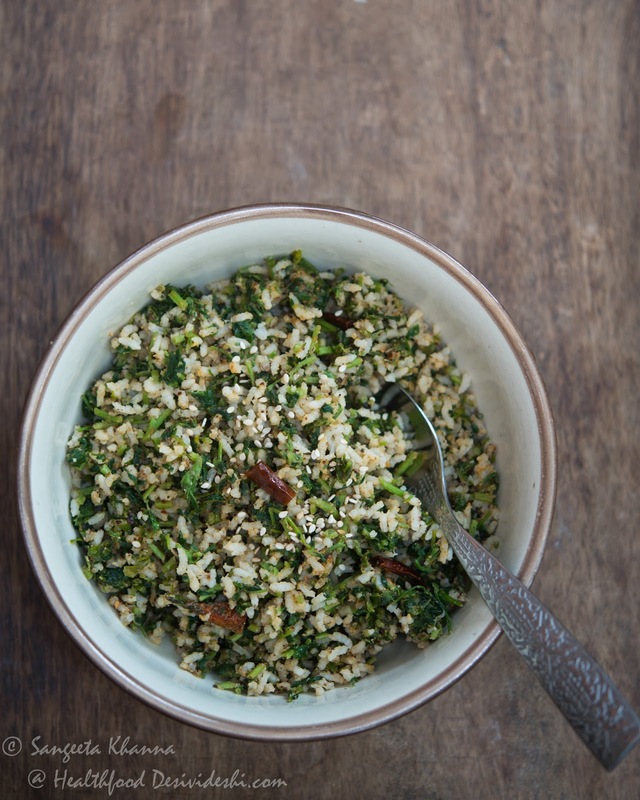 Cooking healthy greens along with the rice for one pot meals works so well if one includes some seeds or nuts in the mix. Do you see how easy healthy cooking can be if you use your ingredients cleverly. Taste is not compromised and you get all the nutrition alright. No compromises on everyday nutrition. Very flavorful rice..its aroma hits me..Yumm..n with simple avbl ingrdt..
Now having white rice would be a bit guilt free after looking at your version. Dear Ushnish...the methi saag is not from the garden , sadly methi saag never grew well in my garden . This was made sometime back when fresh methi was available , but i made it with dried kasoori methi too and with curry patta it was great too. Healthy and yummy rice .. Absolutely love this combo dear, would love to give it a try. I just love the stunning pics and all the trouble you must be taking to record ever step.I am nobody but I still give you the Awesome Chef Award! !